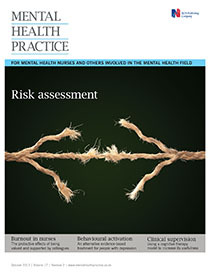 Mental health nursing is an inherently stressful profession that can place significant burdens on practitioners, which in turn can cause burnout. This article describes a study designed to assess burnout among nurses working in three different mental health settings in Ireland. The findings suggest that nurses who feel valued and well supported are less at risk of the effects of burnout than those employed in services where support systems are inadequate.